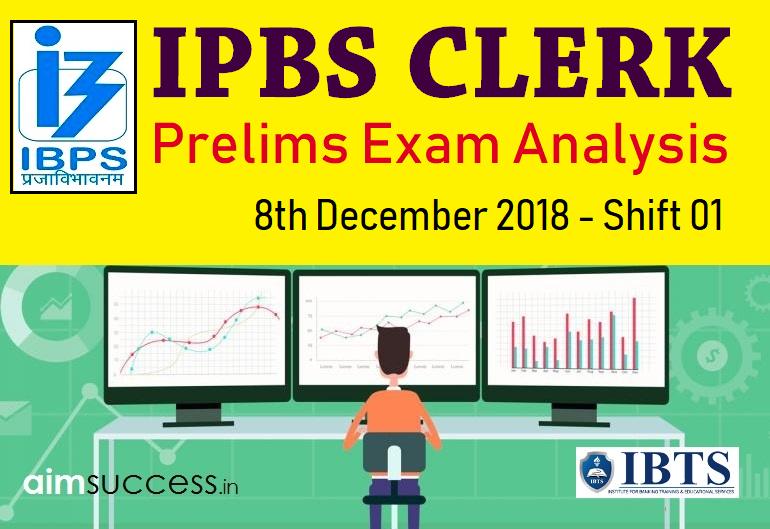 IBPS Clerk Prelims Exam 2018: Most awaited exam of the year is taking place today 8th December is the first day of the first phase of this exam and If you are going to give the IBPS Clerk Exam soon or have given it today, you must be looking for detailed IBPS Clerk Prelims Exam Analysis & Review 2018:. Here we are providing the IBPS Clerk Prelims Exam Analysis & Review 2018: 8th Dec Shift 1. This will help the applicants to have an idea of the exam difficulty level, number of good attempts and therefore an estimate their scores. Besides, those having exam in the upcoming days or shifts can go through the analysis to have an idea of the exam and also know the questions asked in all shifts of IBPS Clerk Prelims Exam. The level of Quantitative Aptitude section was Easy to Moderate. DI questions based on a Tabular DI in this slot. 1, 6, 35, 76, 153, ? 50, 59, 45, 61, 36, ? English section was also of easy to moderate level. There was one set of Reading Comprehension with 6 questions out of which 1 question was of identifying the synonym. The passage of the RC was based on an article related to flexibility in jobs and the availability of working from any remote location. The questions of para jumble or sentence rearrangement were related to a paragraph on the theme of the craze of cricket and it was do-able as well. There were also 5 questions of sentence completion in a match the following format.